When starting the game it looks nice. Video's play etc. But once I gain control... if I walk up to something I can use like a datapad or computer nothing shows up to press "E". Like I can walk up to the girl and look right at her and it never says press "E" to talk. Also say I walk up to that computer and press "E" to use it the mouse cursor comes up but I can't actually see that anything has come up or changed. I think the computers being activated because the mouse cursor shows up but yeah can't see anything new come up like a computer screen etc. Seems that the enviroment looks nice but the Hud or popups for controls don't seem to be displaying, anyone with same problem or advice? Some of you folks will not see your health etc. till later. I understand this. This is nothing to be alarmed about. When I refer to hud I am refering to popups or something similiar to a mouseover. Like when you target the woman in the first room you should have something pop up that says press "E" to talk. Or when you look at a datapad it should say Press "E" to read. This isn't happening. Same for the laptop... there is no press "E" displayed to interact... and when I do I get a mouse cursor but the computer screen never comes up... only way I can tell I'm accessing the computer is because the mouse arrow is up and I can't walk around anymore. Are you still in the intro section? You don't get a HUD until you get augmented, which happens during the credits sequence. I have no HUD at all cant access Map Inventory, Hotbar, Health, Radar, etc. I am playing game (I think) at least guys are shooting me and I am shooting back and looking for the Dr in the Lab which looks like a warzone. you want to make enemies, try explaining something. odd i quit, changed the resolution the game displayed at and now most of the hud is showing, i think it's everything but the aim reticle. i will wait for the first patch to play more i think. I have the steam pc version and I have not seen the hud. Dying quite often in the very beginning of the game (1st combat area) and I'm playing it on easy. Not knowing where the health is on the health bar, is making the game harder for me. I have seen other people with this bug as well, and the only solution I can find is to reload, but my only available save to do so is from over a mission ago. If you guys have any solutions that would be great. I've just completed the first mission in DX:HR and headed into the Detroit Hub. I saved the game and quit for the night. When I loaded the game back up today, My HUD was not aligned properly on the screen. It has shifted about halfway to the left and halfway up the screen. The result is the lower-right quarter of my HUD occupies the upper-left quarter of my screen. As you can imagine, it renders the game quite unplayable as I cannot see radar, health, or energy. I've attempted restarting the game multiple times, adjusted the resolution and FoV, even restarted my computer. I didn't see anything about this particular issue in the forums, so I assume it's quite unusual. Any suggestions on how to fix it would be awesome. Any help from eidos on this would be great and/or info on when this will be patched. Why is my HUD gone?????? I remember it at the start but now it gone. Do i need to aug some thing or is it glitched? 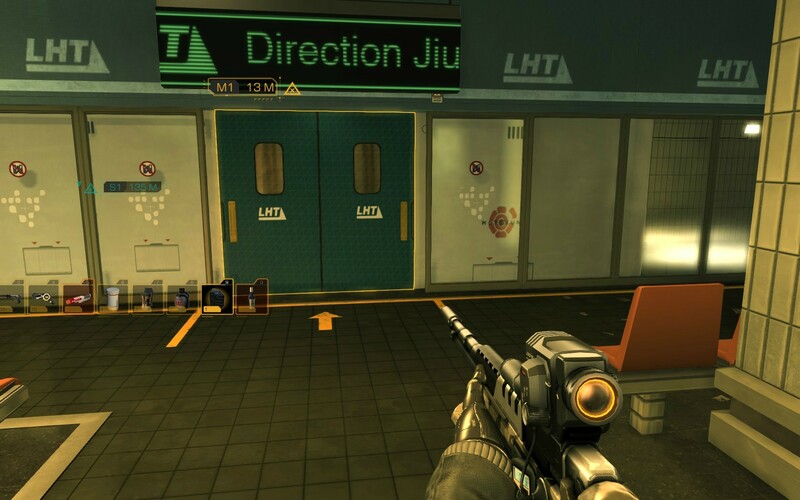 I cant see any thing HUD related not even iron sights, scope, or even an aimer with a rifle. Whats wrong is there some way to turn on and off? 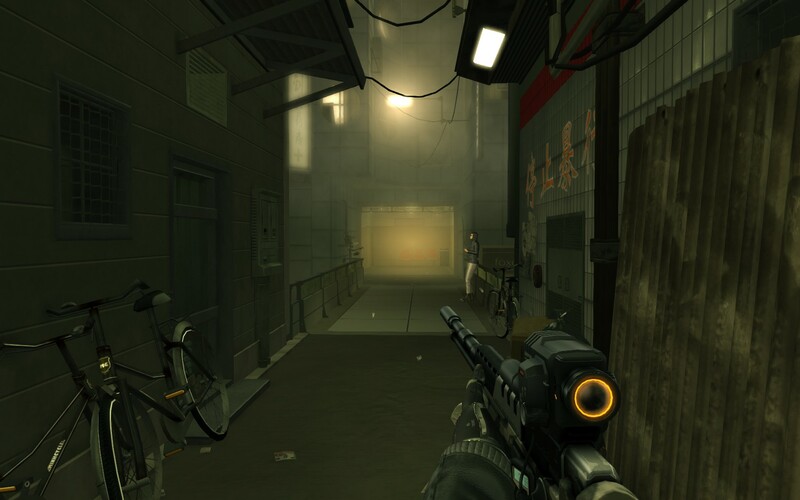 In the very first mission, when Sarif Industries is attacked, you are not yet augmented, so you don't have a HUD. The mission is very short, after that you'll get your HUD. If that's not it, maybe you turned if of by accident in the game preferences - otherwise check the technical help forums. perhaps you turn it of in menu? I had similar problems in another games, strangely solved it by trying out different resolutions. Alternatively, you could start the game at minimal settings -> if the HUD works, you could then consecutively switch on all the options to find out what causes the problem. Some people would kill for a glitch like that! Anyway so I passed the Fema Facility and defeated Barrett however after the battle my HUD was doing the cool graphical thing where when you get hit with a emp or your to close to a grenade it freaks out and reboots and stuff, buuuuut its stuck like that . I thought maybe it was part of the game and someone was going to help Adam repair his augments from the battle but turns out it just has glitched out on me. I have no aim dot, my radar flashes random images, I have no mission point, health bar is all screwy. Like I said looks like I was hit by a emp except its a constant thing . Im thinking I will have to start over 11 hours of gameplay which I am pretty unpleased with > . And sometimes it shows the HUD but in the wrong position. And actually sometimes it won't even let me switch weapons without me tabbing out and equipping. I have the PS3 version and this happened to me today as well. I was playing through the cloak and daggers side mission and all of the sudden my hud disappeared completely. I tried restarting the system and game and it's STILL gone. If I go back to a save from several hours ago it is still there. I will return this game if this is not fixed ASAP. It's ridiculous to have a game where the entire HUD is gone and you can't get it back. FIX THIS GUYS! This is a very serious issue with the game, an answer or response would be nice for all of the people having to deal with this you guys...BS. This game really needs an option to increase the size of the Radar. Now that I've bought the upgraded version that extends the range, it's completely useless. I can't see anything, as all the icons overlap. I'm playing the PS3 version, on a decent sized TV. Other than that, though, it's awesome! Once I made it to China, after deactivating the first of three relay thingies for the sidequest the bartender at the hive gives you my HUD completely dissapeared. Nothing is displayed anymore, no crossairs, health, mission objective location, nothing. The bug persisted though I made it even farther into the game. I eventually gave up and started a new one. For a $60 game on the XBOX I think it's pretty absurd that my game was ruined by a glitch that should never have made it past beta testing. This is just stupid.